I was going over the recipes that I posted about last spring and I came across the asparagus and gruyere tart that I had enjoyed so much and it reminded me that I had wanted to try a mushroom version. These puff pastry based tarts are generally quick and easy to make and they have always been really good! I have been having fun playing with the toppings, both sweet and savoury and I was looking forward to the mushroom topping. For this version, I was thinking of slowly caramelized mushrooms and onions flavoured with some garlic and thyme and held together with some creamy and tangy blue cheese. Gorgonzola has to be my favorite blue cheese and it always goes well with mushrooms so it was my first choice for the this tart. Other than the time that it took to caramelize the onions and mushrooms, this tart came together easily and it turned out great! I just can’t seem to get enough mushrooms and this tart certainly went a long way towards satisfying my mushroom cravings. I will definitely be making this again and again. Add the onion and cook until it starts to caramelize, about 20 minutes. Add the mushrooms and saute until they start to caramelize, about 20 minutes. Add the wine, deglazed the pan and cook until it has evaporated. Spread the mushrooms and gorgonzola over the middle of the puff pastry. Bake in a preheated 400F/200C oven until the a the pastry is golden brown, about 15-25 minutes. would love to try an apple & gorgonzola version of this. you always inspire me kev. love it. This looks soooo good! I remember seeint the Asparagus one. Thanks for the reminder to try that and now this one! Great blog! The dishes never fail to me amaze me. This is no exception. Delicious. Ohhh this looks like mushroom heaven! I'd probably make it on flatbread dough… and then eat the whole thing!! I just stumbled upon your blog and everything looks delicious!!! Thanks so much for the content and yummy recipes! What a yummy tart!! Every time I make puff pastry, I make it with the intention of using it for desserts. Next time, I'm going to reserve some for this savory dish. Thanks for sharing! This tart looks so good! I am having a girls night next week and this looks like the perfect appetizer for it! I may just have to indulge in making this tart for my Italian group meeting next week. I love the combo of gorgonzola and mushrooms and caramelized onions. This looks gorgeous! And all the mushroom goodness? I think I'm in heaven. Thanks for sharing it! Wow. This looks and sounds so good! 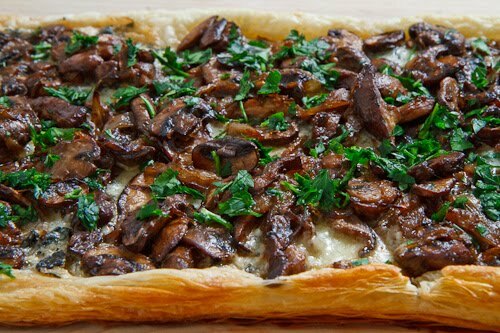 I love all the ingredients – mushroom, caramelized onions, cheese and puff pastry. The combination sounds amazing. This looks absolutely delicious! Gorgeous photo too. Just the thing to serve with a chilled glass of your favorite tipple. Love the rustic look of that tart. A refined and delicious looking tart! Yet again, another scrumptious recipe! The only thing I'd change is the butter, but that's a personal thing. It looks delicious. Good effort. i did a caramelized onion lasagna so i can totally imagine the flavors. looks awesome! Your mushroom & caramelized onion tart looks good and sounds delicious. Even though I only started liking mushrooms recently, I have been craving them lately as well! Love the combo with the caramelized onions and blue cheese. This looks delicious! I wish my husband liked mushrooms. I could eat them for every meal. Delicious! Mushrooms and Gorgonzola; always a winner! I don't think I could live in a world without caramelized onions! I have no idea how you do it Kevin. This looks amazing. I printed this one and will try it this weekend. This looks awesome – love mushrooms, love caramelized onions and putting the two together only makes perfect sense! I'm salivating! The umami factor in this is thru the roof! Must make, and soon. You definitely got my attention with these flavors! This looks like a really easy way to enjoy mushrooms and caramelized onions. I love this tart, looks super tasty! Yum! I could totally imagine this dish as appetizers for my next dinner party. I agree with Dawn, I'd add some blue cheese. Thanks for the inspiration! looks great! caramelized onions make everything better! Oh this looks so so good!! Looks so tasty Kevin! We love mushrooms! I just made this for dinner with a side salad-it was great. Thanks so much! The house smelled delish during the cooking process, and it was so simple with very few ingredients. I tried this yesterday! I couldn't find puff pastry so I used pita bread and baked it for a few minutes. My kitchen smelled wonderful.